One day not long ago, I was invited to a friend’s house to meet her Reiki mentor, Murray. Murray was visiting from Missouri. The whole time we were chatting at my friend’s table, my hands felt vibration, my heart area felt heat. I knew there was something special there.My friend was generous with her guest mentor. I had the opportunity to ask him questions about my Reiki practice, what I feel and why I feel it. His answers were sage. Murray worked many endeavors and lived in different places in this area. About 20 years ago, he owned a horse farm in Hamilton. He knew I had to leave shortly to teach yoga so he asked me if I had time to listen to one story. Yes, I replied. After greetings, they mounted the horses and rode for about 5 hours over his land into state land and back again. During that time, the leader of the unusual looking men told Murray that he used to ride yak, camels and horses and that it was a long time since he had such an opportunity to ride the land like that. He remarked about how much he was enjoying being on horseback again. When the party of horses and riders arrived back at the barn, they dismounted. The leader came over to Murray. He placed his hands on Murray’s shoulders dispensing a special blessing. Murray told me his life has not been the same since that moment. 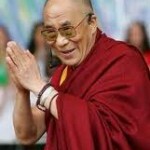 That man was the Dalai Lama who was being harbored at Colgate University. Imagine how easy it was to drive home after that! Life is full of miracles when you least expect them. For a few years, I have been the first one in line at the “no tickets available” line to see the Daiai Lama–both at Colgate and Cornell. Who would have guessed that he would come to me at my friend’s house out on a country road in the form of a 70+ year old stranger? Epilogue: I did eventually have the opportunity to see the Dalai Lama speak at Syracuse University.